You may add both translators and colleagues to your team, including managers, administrators, etc. Click + next to the People menu or on the page with the same name. If the invitee is not yet signed up with Smartcat, only you and your managers will see their profile. Complete the remaining fields: full name (unless the user is already on Smartcat) and access level, your personal message to the invitee, and the email language. Click Invite. The invitee will get an email with sign-up instructions and a short platform overview. If you want to invite the user to translation projects in the future, add their language pairs, services — translation, editing, proofreading, layout, etc. — and specializations. Smartcat will automatically calculate the service price and include any repetition- and TM-based discounts. Click Add services on the member’s card. Click Add service on the page that opens. Select the language pairs and services this member covers. Step 3. Ask invitees to complete their profiles. Upload a CV and sample translations. Don’t worry, your added members’ profiles will only be visible to you and your managers. These details are just meant to make your work with team members more convenient. 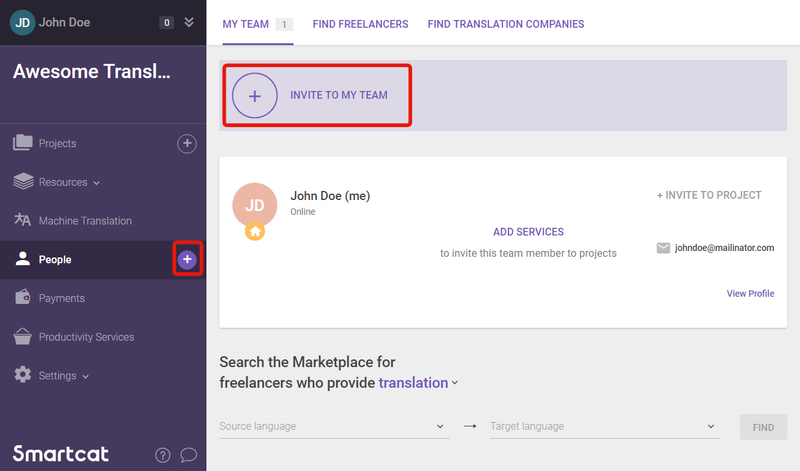 If you can’t find the right linguist in your team, you can search the Smartcat marketplace by clicking Find on Marketplace under the member list. You can invite a member to an existing project by clicking + next to the document name and choosing the member from the list. 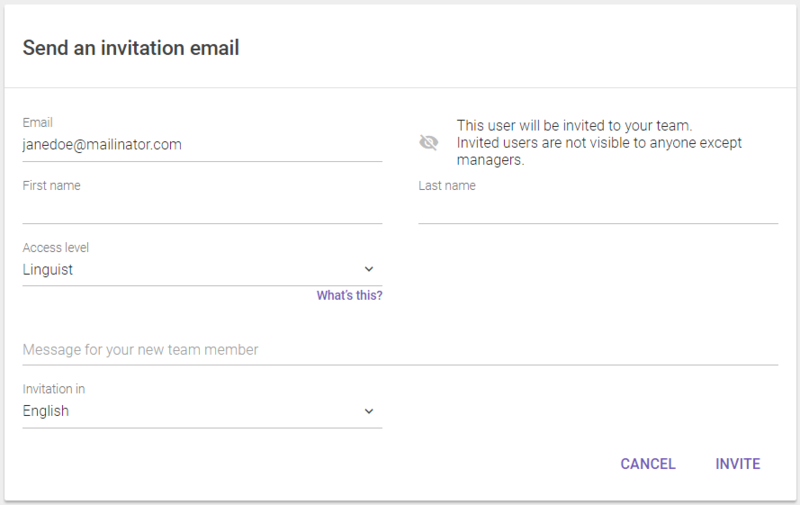 You can also invite a member right from their profile — either to an existing project or by creating a new one specifically for them. How to set up access levels? Assignee Only view and work with projects and documents assigned to them. Resource manager Same + manage the account’s TMs and glossaries. Project manager Same + create, delete, and change any projects, including those NOT created by them. Administrator Same + add and delete users, manage paid services, and pay for assignees’ jobs. You may add your own access levels in Settings → Access levels. For example, you can configure a higher access level to a certain project. How does this work for team members? Assignees will see projects assigned to them. Resource managers will also see the account’s resources (TMs and glossaries). Project managers will see all projects. Administrators will see the same features as you do. Bank cards, PayPal, and wire transfer payouts are supported for all countries. Local payout methods are additionally supported for some countries. In Russia, for example, freelancers can received payouts to Yandex.Money, QIWI, and WebMoney. What do the icons next to team members’ names mean? 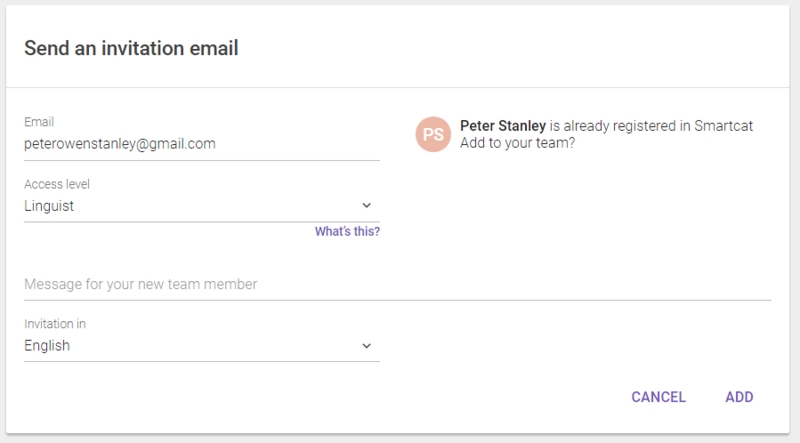 How you can work with team members depends on whether you have added them manually or found them in Smartcat and, in the former case, whether they were signed up with Smartcat before. Only you and your managers can see this user. No other customer can find them in Smartcat. You see their email and can enter additional contact details. To have the price of their work calculated automatically, configure rates in their profile. All Smartcat users can see this member. You DO see their email. You CAN pay them via Smartcat. You can edit their rates in their profile. You do NOT see their email. You MUST pay them through Smartcat. You may edit their rate if you have negotiated special prices with them. The new rate will only be visible to your company and in the job invitation to freelancer.